There are various factors that need to be taken into consideration to help determine healthy body weight. For instance, it depends on your height, age, gender, fat percentage, bone density, etc. The most popular way to find out whether you are underweight, healthy, or overweight is to calculate your Body Mass Index (BMI). BMI for normal weight ranges between 18.5 and 24.9. If it is below 18.5, it indicates being underweight and if it is 30 or more then you are likely to be obese. BMI ranging between 25 and 29.9 means that you are overweight. Health authorities in certain countries have set BMI value below 20 as underweight. Thus, these standards may slightly differ from one country to another. Moreover, the BMI does not take your body-fat percentage into account. Ideally, men should have about 10-22% body fat and women should have about 20-32% body fat. It can be measured with the help of Skin Fold Caliper or through methods like Bioelectric Impedance Analysis (BIA), Underwater Weighing, Dual Energy X-ray Absorptiometry (DEXA) Scan, and Anthropometric methods. You can also assess your waist to hip ratio (WHR) to determine whether you are at a risk of developing health problems or not. For men, it should be less than or equal to 0.95 and for women, it should be 0.80 or lesser than that. Males with WHR of 1 or more and females with WHR of 0.90 or more are likely to be at a higher risk. To determine your waist-hip ratio, measure the circumference of your waist (just above the belly button) and the circumference of your hips (at the widest part). Finally, divide the size of waist by the size of hips, both in inches. It is believed that those who have a tendency to gain weight in the abdominal area (apple body shape) are more susceptible to health problems related to obesity (for instance, coronary heart disease, diabetes, high blood pressure, and so on) than those who tend to gain weight around the hips and buttocks (pear body shape). 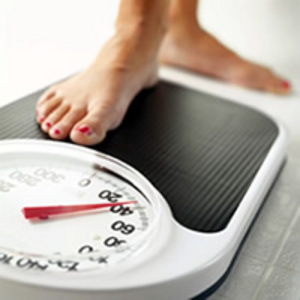 Furthermore, you can find out if you have an ideal body weight or not as per your frame size. For this, you need to check whether you have a small, medium or large frame by holding your wrist with your thumb and middle finger. If they wrap comfortably around the wrist then you have a small frame. In case they barely touch then you have a medium frame. When the medium finger and thumb are nowhere near touching while encircling the wrist, it means that you have a large frame. Now, take the portion of your height exceeding 5 ft and multiply this figure (in inches) by 6. Next, add 106 to this figure. The resultant value is your average ideal body weight in pounds if you have a medium frame. Those with a small frame need to subtract five pounds from the resultant value to get their ideal weight. As for those with a large frame, they need to add five pounds to it. In case you want to analyze your weight, divide your actual weight with the ideal body weight (calculated with the above mentioned procedure). If the resultant value ranges between 1 and 1.10, you have an ideal weight. If the value is below 1, it shows that you are underweight. When the value is between 1.11 and 1.30, it indicates that you are overweight (1.11 to 1.20 means slightly overweight). When the resultant ratio is 1.31 or more, it points towards obesity. This method is most suitable for 20 to 65 year old individuals.